Sony KDL-55W805C review | What Hi-Fi? Ultra HD 4K screens may be grabbing all the headlines, but Full HD screens are still in the majority. This 55in screen has a 1080p Full HD resolution, features Google’s new Android TV platform, and offers an enjoyable big-screen picture for £1100. The KDL-55W805C gives a crisp, glossy picture. All the shimmering colours in Jupiter Ascending on Blu-ray look vivid and rich, with layers of fine detail bursting out. The bright colours of the planets and shining structures pop against the deep, inky black of space – it’s quite dramatic. The Sony screen’s luscious blacks are impressive too, drawing you further into a scene. We’d like a touch more clarity and subtlety, especially when watching a dark show such as Daredevil on Netflix, where large expanses of shadows (verging on pitch-black on the Sony screen) tend to swallow up detail. The subtle gradations in shading – whether in a grey suit, the side of someone’s face or a wall – aren’t fully revealed by the 55in screen. You lose some of the sense of depth, too, with characters in the foreground meshing in with the dark backgrounds. There’s a slight yellow tint to the colour balance. You can see it on the bright white outfits at the Wimbledon tennis, and in skin tones that look a little too sallow to be fully natural. However, the rest of the KDL-55W805C’s palette has an appealingly exuberant tone that is exciting to watch. Grass-green tennis courts, clear blue skies and the purple branding all look clear and punchy when watching in Freeview HD. Change over to the standard definition broadcast, and the expected drop in clarity doesn’t rob the picture of its strong contrast or bold colour balance. It’s quite noisy, though: you can see the speckled noise clinging around the edges of the Wimbledon whites, moving as the players move across the court. Sony’s motion settings are worth having a play with here, as they’re subtle enough to have a smoothing effect without the picture looking too artificial. We’d urge you use a THX Optimizer disc to tweak the picture settings further on the Sony. We just wish the settings would apply to all the inputs and media, as having to re-do all of them when watching Netflix or a 3D film (active glasses are not included in the box) can be rather tiresome. If you’re watching something that’s dialogue-heavy, the Sony’s clarity and directness will shine through. Voices are crisp and expressive, yet there’s little impact to the overall sound. We’d like a weightier presentation, especially when watching Blu-rays. Sony has implemented Android TV as the smart interface across its 2015 TV ranges. It’s a clean, spacious and orderly layout. Scrolling up and down through the list is swift and simple, and it’s handy having your most recently opened apps clearly displayed. Our only niggle is that there are some mild stutters in the operation. Netflix heads the collection of on-demand apps that now comes as standard with smart TVs, including Amazon Prime Instant Video, YouTube and BBC iPlayer. It’s not an exhaustive selection, but Sony keeps adding to this list with successive software updates. Android TV has a neat way around missing apps, though: Google Cast support. If you have an app opened on your smartphone or tablet, you can ‘cast’ it to your Sony TV. It’s not quite the same as having the native app on your TV, but it’s one way to work around it. Android TV also comes with the perks of Google Play Store, so you can download TV shows, movies, games and music straight to your TV. We connected the Sony TV to the internet using wired and wireless means, and found both to be stable. 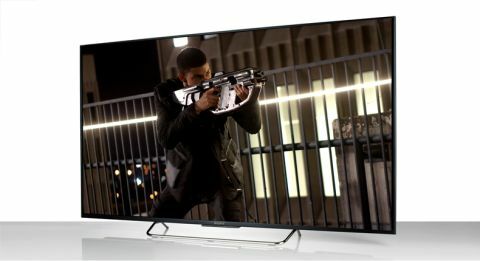 The Sony TV is sleek and slim, with a thin sliver of bezel surrounding the 55in screen. The build is sturdy despite its elegant frame, standing firmly on a similarly sleek, metal stand which slots in neatly under the TV. It’s not slim all the way – the back end bulges at the bottom to house the KDL-55W805C’s connections, including four HDMI inputs, three USB ports, and an optical output. Freeview HD and satellite tuners are also provided. You get two remote controls with the TV: a standard unit and Sony’s One-Flick touchscreen-dependant remote. We’ve always got along well with Sony’s standard remotes, which are intuitive to use thanks to logically placed buttons and speedy response times. The One-Flick remote (above) doesn’t feel quite as instinctive in comparison. Its light, plastic body feels cheap, and although the swiping functions work better with the new Android TV interface, we still feel more comfortable using traditional buttons. The Sony’s 55in screen is the biggest draw here. You could easily buy a 4K resolution screen for less (the Panasonic TX-40CX680B at £700, for instance) but you would be sacrificing the benefits of having a large, vibrant screen. The KDL-55W805C may not be perfect, but it’s an engaging, inviting screen that is well worth a look.